A few weeks ago, I heard we had a new neighbor in Historic Dublin. Intrigued, I packed my camera bag and went to photograph the wares. When I walked into Thalia & Dahlia, I met Christopher Krupa, one of the owners. Krupa and co-owner Michael Smith, both of whom previously worked at Curio Cabinet in Worthington, opened Thalia & Dahlia in September. We discussed the philosophy behind the gift shop, and he expressed his nostalgia for the way shopping "used to be," relaying to me stories about a time when shopping meant more than rushing around the mall, visiting a collection of national chains where "unique" means "exactly like a million others." Krupa was quoted in the Dublin Villager as saying, "Shopping used to be an experience. People used to get dressed up and go shopping. We want you to be excited about shopping again. We want it to be a wonderful experience." A wonderful experience is exactly what the boutique provides. 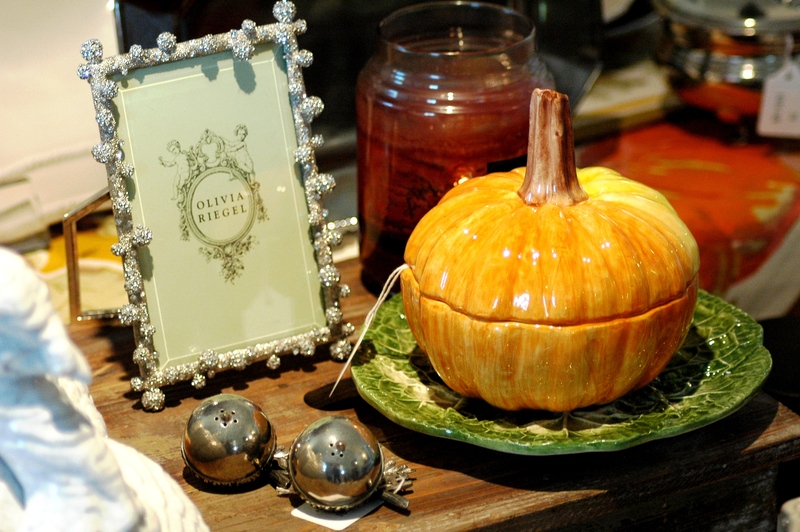 Located in a charming building on High Street -- you know, one of those old houses with character to spare -- Thalia & Dahlia offers a true variety of quality, unique items, from wreaths and flower arrangements (both hand-crafted by Krupa) to linens and tableware. I loved the various picture frames (one pictured above) and gorgeous china (example pictured here filled with lemons). My favorite thing about Thalia & Dahlia is that their inventory is always changing, with an emphasis on seasonal items. Halloween items were featured in October and Thanksgiving will be featured this month. I was delighted to hear that Thalia & Dahlia will not be putting out Christmas inventory until just before Thanksgiving. With most businesses jumping headfirst from Halloween into Christmas, by the middle of December I&apos;m ready to kick the next Santa I see. No offense to Mr. Claus, it&apos;s just too much! To my relief, Krupa told me that Thalia & Dahlia will debut their Christmas decor at an open house set to be held the weekend before Thanksgiving. Each room of the store will have a different theme. I&apos;m already excited. But let&apos;s not get ahead of ourselves! In the meantime, you can attend their Thanksgiving Open House this Saturday from 10 a.m. to 4 p.m. to see the lovely items available this month, as well as enter a drawing to win table linens. The boutique is located at 113 S. High St. For more information, call them at 614/336-8582. If you can&apos;t make it in this Saturday, put on your finest and stop by Thalia & Dahlia during regular hours: Tuesday through Friday 11 a.m.-7 p.m. and Saturday 10 a.m.-4 p.m. Happy shopping! To see the rest of my photos of Thalia & Dahlia, click here.